Stepping off the plane, I had a quick taste of the late-July Nashville heat and realized that I was in for a very sweaty three days! 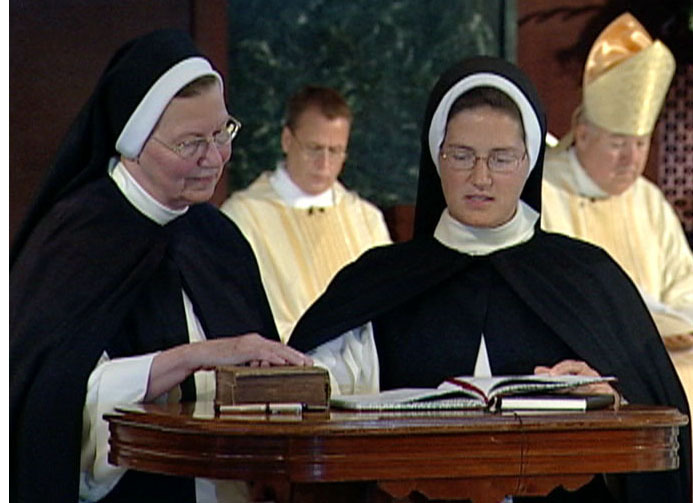 I was sent to Nashville by Salt + Light to film the Final Vows and First Profession of the Dominican Sisters of St. Cecilia Congregation, or the Nashville Dominicans as they are commonly known. The filming is for a future Salt + Light project about this rapidly expanding, nearly 150 year old, Congregation. After a walkway of country superstar prints I made it to the arrivals area in the Airport and saw two sisters. “Hi there, my name is Matthew Harrison and I’m from Salt + Light. Are you here to meet me.” I asked with the biggest Canadian smile I could muster. Don’t get me wrong, it was a cheerful ‘no,’ but it caught me a little off guard! The two sisters were waiting to pick up a Dominican priest and suggested I look by the baggage carousels and there may be a Sister there (if not, they assured me they could give me a ride). As soon as I moved down the escalator I saw another Sister. Thankfully, she and another sister would take me to the Motherhouse. As we traveled from the Airport to Dominican Drive I was struck by the enthusiasm of the Sisters. They were not only excited to welcome me, but they were very willing to assist me in the filming. Already I was feeling at easy, and like many things in the Nashville sun, my earlier worries were melting away. My first task was to get oriented; to get a feel for the Nashville Dominicans. You can tell a lot about a religious community by the way they worship, and so attending the Golden Jubilee Mass of Sister Mary Herman at the beautiful St. Cecilia Chapel, would give me an idea of what the Sisters were all about. Before I go any further, I should mention that these Nashville Dominicans are not a small community. There are about 220 Sisters in this community (another interesting factoid: the average age of the Sisters is 33!). A Chapel that has to house 220 Sisters, as well as outsiders attending for daily or Sunday Mass, ends up being larger than many Churches I have been to! It was impressive to witness the sea of black and white habits as the sun shone through the traditional stainglass windows portraying the life of St. Cecilia! Three quarters of the way through Mass I was fighting off tears. Everything – the reverence, the phenomenal choir, the solemn yet joyous liturgy – it was all magnificent. It was then that I happily realized that this was going to be a working retreat for me! I fell asleep Saturday night aching and exhausted but pleased with what had been accomplished, and excited about what was to come. Sunday was the Mass for the Rite of Perpetual Religious Profession. 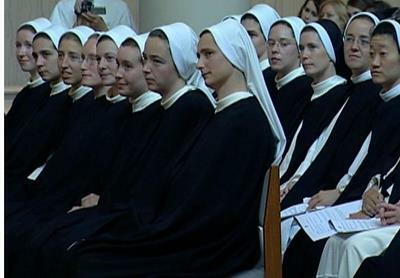 This was when 11 Sisters were going to take final vows – it was their wedding day! I was impressed as I panned the camera across the row of Sisters making their final vows. Some looked nervous, some looked calm, and others looked in ecstasy; eyes rolled up to the crucifix that hung above the altar of St. Henry’s Church. As a cameraman you’re always looking for an interesting picture composition – be it lighting, framing, emotion, etc. I was not disappointed during the Mass! I think it was the third Sister to make her profession. I had a tight shot on her hand as she placed it on the bible and began her profession of vows. And then I heard her voice crack. I didn’t even look up, but immediately re-framed to the Sisters face, checking to make sure it was in focus, and locking off my camera in a tight close-up. She was struggling to continue. Tears were welling up in her eyes. Tears were rolling down her cheeks at this point. Poor Sister offered an embarrassed smile to Mother Ann Marie and apologized for being overcome by emotion. If everything else failed during my trip, I would have been satisfied just to have filmed that moment. It was incredibly touching. It was beautiful beyond words. It was genuine emotion that couldn’t help but pierce your soul. It wasn’t a Sister shedding tears of regret, but it was a Sister shedding tears of love. The remainder of the filming of the Mass went well, and footage of the reception afterwards was rewarding too. There was an aura of joy to the Sisters as they played with children and greeted well wishers. I finished the day looking out my hotel window, across the street of the Motherhouse. There was something very special happening there, I thought. I laid down to bed, choral refrains coaxing me to sleep. My final day in Nashville began early. At 6:45am I was wandering around the grounds of St. Cecilia’s filming the sign at the Motherhouse gate, exteriors of the main building, and St. Dominic’s statue. Water, from I assume the sprinkler system, dripped off Dominic, as he stepped forward hand out, and a bible pressed close to his heart. I imagined that the water was actually droplets of St. Dominic's zeal and love for the faith. Each drop fell from the statue, was absorbed into the ground, and provided fuel for this impressive Congregation! As you may have guessed, the peaceful morning, and soothing sounds from the birds certainly aided in daydreaming! Early morning soon turned to mid-morning, and I found myself at the Cathedral of the Incarnation, preparing for the Mass for the Rite of the First Religious Profession. The Cathedral is quite splendid and there were plenty of statues and decor to film had I the time or the tape! After receiving the veils, the Sisters each go before the Prioress General and the Novice Mistress, kneel down wearing a white veil, and pop back up wearing black! It's a quick exchange, very simple, but very powerful. The blessing of the scapulars also caught my attention. The Sisters lay prostrate with the scapular flipped over their head. The Bishop then blesses the scapular with holy water. The Sisters will kiss the scapular whenever they enter the chapel. Interestingly, I’m told that upon their death, after the body has been viewed by the congregation, the scapular is placed over the deceased Sister’s head – recalling when the scapular is first blessed (the scapular is also kissed, this time by the Mother). Like the previous Masses I had attended with the Dominican Sisters, the liturgy was wonderful; solemn, wrapped in stunning sacred music, joyous, and very reverent. After Mass, I filmed portions of the reception at the Motherhouse. The reception included an elaborate layered cake made by two professing Sisters -- needless to say from their music, to their art, to their teaching, to their baking skills, this group of Sisters is a very talented bunch! I wrapped up my trip to Nashville by filming a cell (a Sister’s room), and the novice dormitory (all under supervision, of course!). I realized that it was very special for me to film these locations. These areas are generally off limits to the public, but the Sisters want others to know about them. It was a pleasure and a privilege to not only experience a sliver of the life at St. Cecilia’s, but also to document it, so that it may be shared with others. It was with a sense of sadness that I left the Nashville Dominicans. I could have stayed longer, and filmed much more than the 13, 40 minute tapes that I brought back to Toronto. There is a peace at St. Cecilia's. There is a joy. I left Nashville feeling spiritually refreshed! God has blessed us with the beautiful witness of these young women. He shows us that though it may not be as common as it once was, there are young women who are not only called to live a radical way of life but young women who are willing to answer that call. I witnessed it first hand. Under that blazing Nashville sun, I saw joyous brides readying themselves for the New Dawn. St. Dominic -- pray for us! St. Cecilia -- pray for us!